"Dhoni is one of the finest leaders in the game in the last 30 years and is at par with the likes of Imran Khan, Mark Taylor and Arjuna Ranatunga." "The coolest man in world cricket - MS Dhoni delivers when it most matters!" "If I am supposed to select a team, Sachin will be the opener and Dhoni will be the captain"
"He has that uniqueness to respond to a tough situation with ease. He does not involve himself much emotionally, and that's his quality. India are lucky to have a captain like Dhoni"
"The best compliment for me is when someone says they'll pay to watch me play, And I can say that I'll pay to watch MS Dhoni bat. MS is not the next Gilchrist. He's the first MS Dhoni." "He is a great leader by example. Someone whom I have always admired." "When I die, the last thing I want to see is the SIX that Dhoni hit in the 2011 World Cup Final"
"If 15 runs are needed off the last over, pressure is on the bowler... not on MS Dhoni"
"Dhoni is the greatest captain of our country. His record is proof of that"
"I would go to war with Dhoni by my side"
"I am really gifted to play under the leadership of MSD"
"Dhoni has the respect of all other playing nations. I've found him to be a really strong leader"
"I am learning the ropes of captaincy from MS Dhoni"
"Dhoni is the best captain I have played under"
"Dhoni is my Hero. 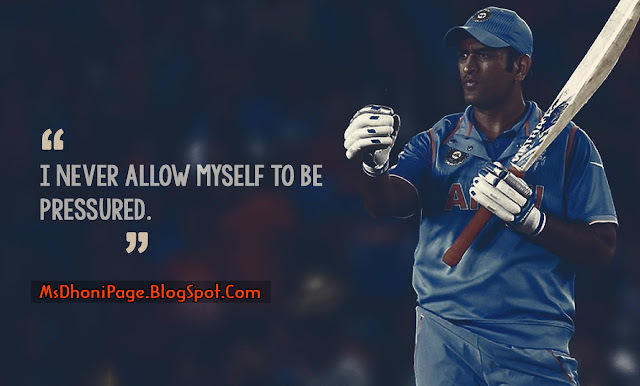 We talk a lot about Sachin Tendulkar & Virendar Sehwag, But this boy has as much as talent as anyone on the game"
After the World Cup 2011 final, "Dear Mahi, The moments of our journey will stay with me forever"